Well, no, I thought. And neither have I. There’s too much text for my grandson, but not for me. I read my first Tove Jansson book about four years ago. It was called The Summer Book, and it was on the adult shelves. It was the cover that attracted me first. It’s a paperback, but it has flaps, so you can easily mark where you stop reading. I like that. And I’ve no idea why, but the cover is nice to the touch – soft and smooth, but substantial. It shows a deep blue sky (Aquamarine? Ultramarine?) with just a couple of light cloud trails, and in the bottom quarter of the page is a small wooded island, edged with a pale stony beach, set in a dark blue sea. It’s about an elderly artist and her six year old grand-daughter and a summer they spend on the island. Nothing huge happens. When the southwest wind was blowing, the days seem to follow one another without any kind of change or occurrence… It was just the same long summer, always, and everything lived and grew at its own pace. 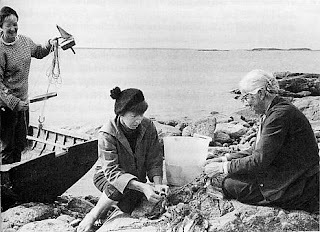 It’s a small world, with only a few characters, and Tove Jansson simply takes you right into it, so that you come to know the place and the people very well, in all their apparent simplicity. You enter deeply into the way they experience life. And that isn’t an easy thing to do, either as a writer or as a human being. I’ve read her other adult books too, though I think The Summer Book is my favourite. But the Moomins are what she’s famous for, and until now they have completely passed me by. I had vaguely thought I might have seen a television series, but then realised I was confusing it with something else – was it called The Clangers? About triangular shaped characters who lived on the moon and made funny squeaky noises? And then she (his mother) took Moomintroll by the hand and went into the sky-blue room. And there in the valley they spent the whole of their lives, apart from a few times when they left it and travelled for a change. It’s the same voice as it is in the adult books: cool, clear, utterly unpretentious and essentially rather serious. I love it, and though I’ve come a bit late to the Moomins, I intend to make up for it and read my way through the rest of them. Are there any other fans out there? And if so, can you explain what it is that you like about them? Ah, how lucky for you to discover the moomins! What a pleasure! I have always loved them, and shared them with my children (one loved them, one couldn't see the point). "Any book would be better with a moomin in it" - there's an interesting idea. As you say, War and Peace with moomins. Move over, Pride and Prejudice with zombies. I was introduced to them by a school friend with whom I've long lost touch, but to whom I will always be grateful - thanks, Penny! I ADORE the Moomins. I first read Finn Family Moomintroll when I was seven. It was a present from my big sister (who has impeccable taste. I've been a fan ever since. The books are full of quiet wisdom! Moominpappa at Sea probably mu favourite- although it's hard to pick. So difficult to pinpoint what's great about the Moomin books - but I think you've probably nailed it: "cool, clear, utterly unpretentious and essentially rather serious". Yes - only we should perhaps add, very funny indeed. And, in the least mawkish sense possible, wise. A new writer for me - thanks for the introduction! I haven't read a lot of the Moomin books - something I should probably put right - but I did happen on the one set in midwinter. I was impressed by the sense of still eeriness that book conveyed. I think you might be on to something there! As Stroppy Author said, move over 'Pride and Prejudice and Zombies', here comes 'Oliver Twist and the Moomins'! Or maybe 'Of Mice and Moomins'? 'The Wonderful Moomin of Oz'? I absolutely adored the Moomins too, and when I started having my own Finn family (in that my partner's surname is Finn - obviously I couldn't resist giving it to my children) I longed for the day when they would read Tove Jansson. Alas - not one of the four fell for the Moomins quite like I had! I have just done the same thing with my 7 year old funnily enough! I went into my local bookshop and there was a huge Moomin display so I bought Comet in Moominland even though it's a bit much for him to read for himself because it's exactly the kind of thing that he likes being read. He likes gentle stories with a serious tone best of all and these can actually be hard to find. I have no idea how I managed to never read the Moomin books as a child (as I read A LOT!) but I have really enjoyed what I've read so far. It reminds me of Pooh too- it's oddly Zen in tone isn't it? By some odd kind of synchronicity we have just finished reading your book Emily's Surprising Voyage funnily enough as he is studying Brunel and the SS Gt Britain at school. It was exactly the kind of book that he likes as it was gentle and human yet got him thinking about all sorts of other things too (like the welfare state, industry, travel, modern communication etc). Great book- thanks! 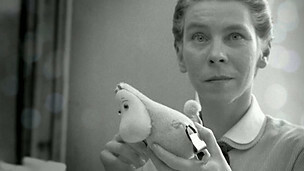 Around New Year, I saw a really good tv documentary about the artist Tove Jansson. 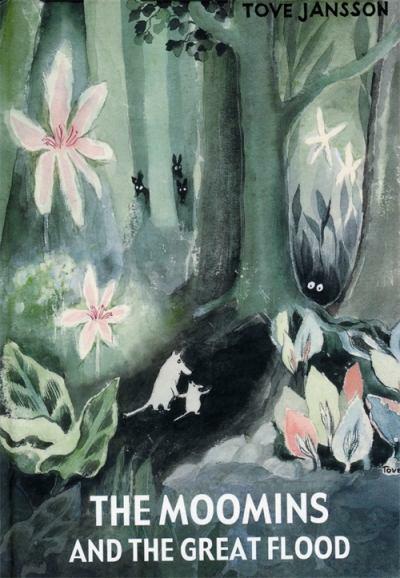 It gently linked aspects of her life to characters that appear in the Moomin novels. Her own work as a painter was overwhelmed by Moomin's popularity (The Sherlock/Conan Doyle effect)as well as by the totally punishing schedule of the contracts she had agreed to. If you can catch the documentary somehow, do! She eventually lived - and was happy - in a shack on a very small island, such as I imagine for the Summer Book. (It was a beautiful book production - I bought it as a present and didn't like to read it first. The documentary also solved a Mommin mystery for me. It showed that Moomin had appeared as a syndicated strip cartoon in the Daily Express newspaper(or was it the Mail? )which might explain why some children/people were really familiar with the Moomin world and others (ie. non-Express reading families like my own) didn't. I do intend to try out a Moomin novel this year but when I was young, there was something indefinably scary about the illustrations though I can't quite say why. I put them back on the library shelves. Maybe looming Moominmama? Maybe that small angry character? I'm hoping this year's reading might sort out the mystery. Perhaps. Cathy - of course you're right to flag up the humour too, and the wisdom. I'm one of those that missed out on the Moomins, but I have just taken a copy of Finn Family Moomintroll out of my local library, so plan to put that right. I saw the documentary on Tove Jannson that Penny mentions - it was fascinating. It was on BBC 4 so look out, it will be back sooner or later. I read The True Deceiver a few years ago, but have never read any of her Moomin books - about time I rectified that! Thanks, Sue. The A4 sized, hardback collections of Moomin cartoons are fabulous too - very popular with my very visual son. There are about five of them. I read The Summer Book on a beach in Cornwall a few years ago; it seemed the only appropriate place to read it. You're right that the feel of the cover was a large part of the pleasure! I think I shall go and take it off my shelf and stroke it and maybe read some and recapture that summer light at this dark time of year. Penny - I did see the documentary and very much enjoyed it. Hope it comes on again. Gorgeous blog. I love Tove. Which reminds me: I left a Moomin at the bottom of my shopping. When I got home it smelt a bit trolley. Came to this late and also to the moomins late. They somehow never travelled to Africa. but then a Swedish friend introduced me. The fact hat your post has evoked so many responses shows how well-loved they are. I think you hit it spot on when you said the books like Tove are: 'cool, clear, utterly unpretentious and essentially rather serious'. I think Catherine also used the word 'wise' and thats how she comes across in her relationship with her granddaughter in The Summer Book. When my own granddaughter is here with me at the sea, I feel very close to that book. Then there is also The Winter Book too. I'm off to buy The Summer Book now. Thank you for such a compelling introduction. My grand-daughter has little moomin playmates, and I read mooomin stories to her, courtesy of her Finnish mother. I never had these stories myself when I was young, unfortunately. Thank you so much, everybody, for all your lovely comments. Tove obviously has a great many fans!